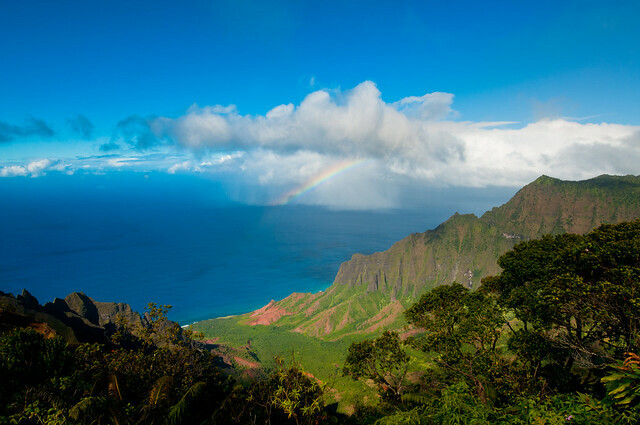 Like everyone else before me, I have always wanted to visit Hawaii. The vegetation is quite outlandish. Everything grows on top of everything else. Tall trees, huge ferns with giant fiddleheads, and at least three different types of creepers smothering those tall trees. Even road signs and lampposts are not spared. 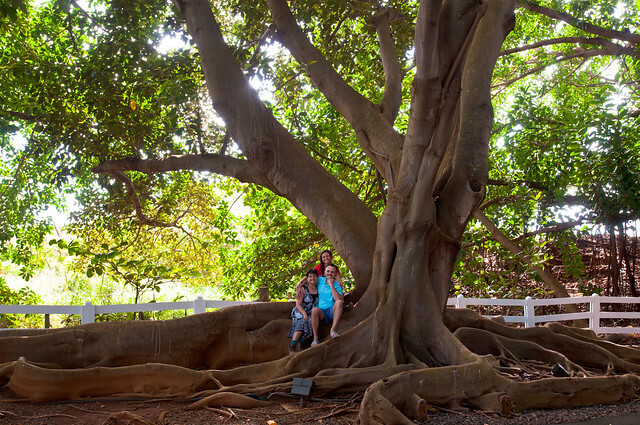 Several of my favorite vegetables and fruits are grown in Hawaii. Two of them, guava and ivy gourd, are considered invasive and another, sugarcane, is no longer cultivated and grows wild by the roadside. I really wanted to see ivy gourd vines but it was either not the season or I don't know how to recognize this plant. It grows along fences and while it is considered pretty for its flowers and its ripe red fruit, it is really the unripe green fruit that is valued in Indian and South East Asian cuisines. 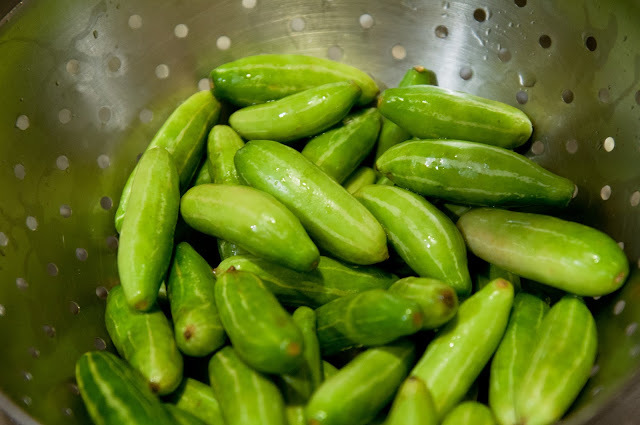 Ivy gourd has been incorrectly called Indian gherkin on many food blogs. It is not a gherkin. Adding a prefix of Indian does not make it tendli, tondli or kundru. So please, just stop. Many recipes call for steaming of the little plump gourds before seasoning with spices. Some folks pressure-cook this poor vegetable to death before cooking with it. I am a fan of its crunch and prefer to not pre-cook it. Prepping tendli is the most laborious part of making this vegetable side. 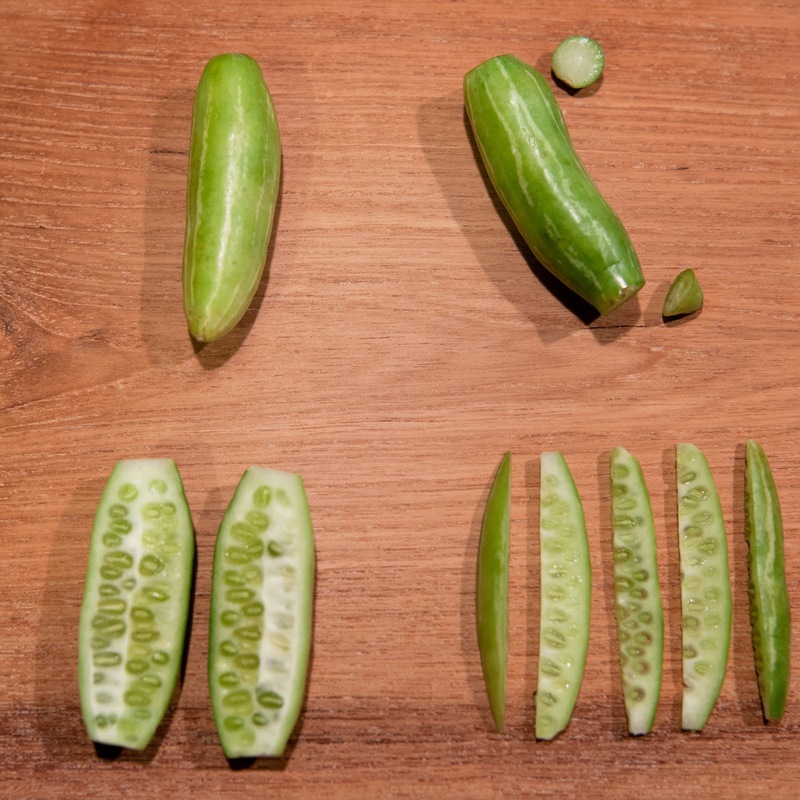 Each little plump gourd must be prepped thus: top and tail, slice into two along its length, julienne each half into 4-5 pieces depending on the thickness of each half. Discard the ivy gourd if it is pinkish or reddish on the inside. As the fruit ripens, it softens and turns red from the inside out. As it ripens, it also develops a slightly sour taste that is not very pleasant. It won't kill you if you eat it though. Potatoes, the universal extender, are a must. Peel and slice them to an even thickness, like french fries, and a length that is about the same as the length of the ivy gourd. Please use waxy potatoes. Baking potatoes are not ideal for Indian cooking. You could also slice the ivy gourd along its width to make rounds. In that case, dice the potatoes into small cubes. 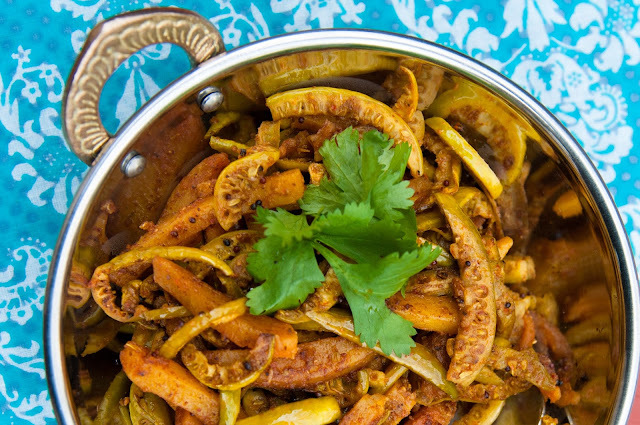 What follows is one of my favorite ways to cook this dish, tendlichi bhaji. The key to making this delicious is to get the phodni right, by not overheating the oil and not burning the whole as well as powdered spices. Since I like the ivy gourd to be crunchy, I cook the potatoes until they are almost done and only then add the sliced tendli. 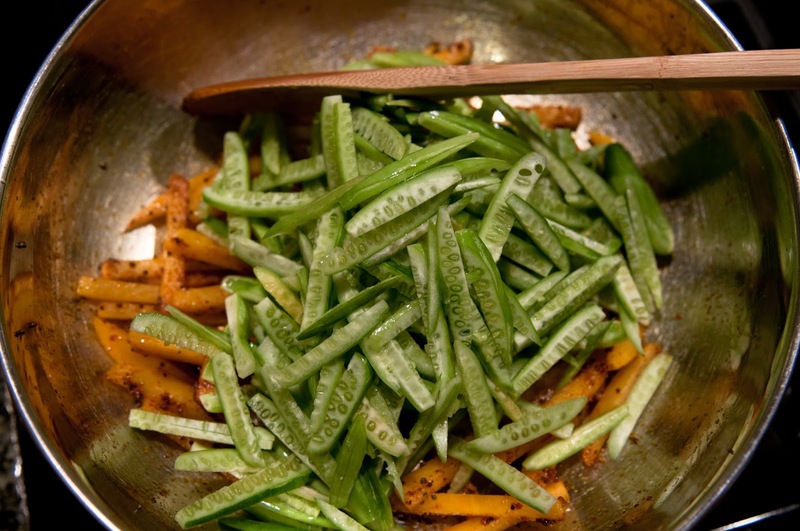 If you aren't a fan of crunchy vegetables, add them at the same time. Heat oil in a medium kadhai or saucepan until it shimmers. Do not bring it to smoking point. Add mustard seeds and when they pop, add asafetida and quickly add turmeric powder and red chile powder. 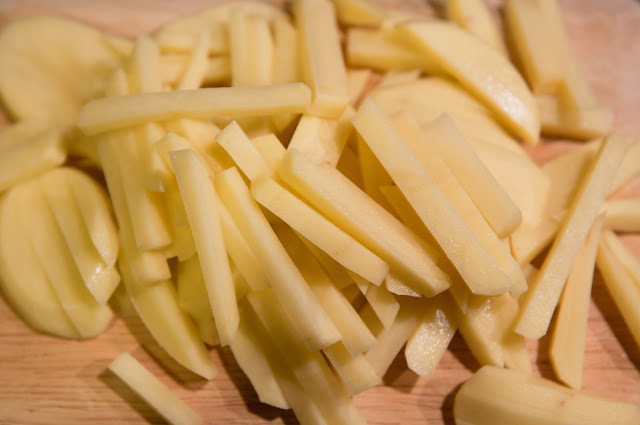 Immediately add sliced potatoes and mix to coat the potatoes with the seasoned oil. Add half the salt, stir occasionally and cook uncovered on medium heat until the potatoes are almost done but not quite. About 7-10 minutes. 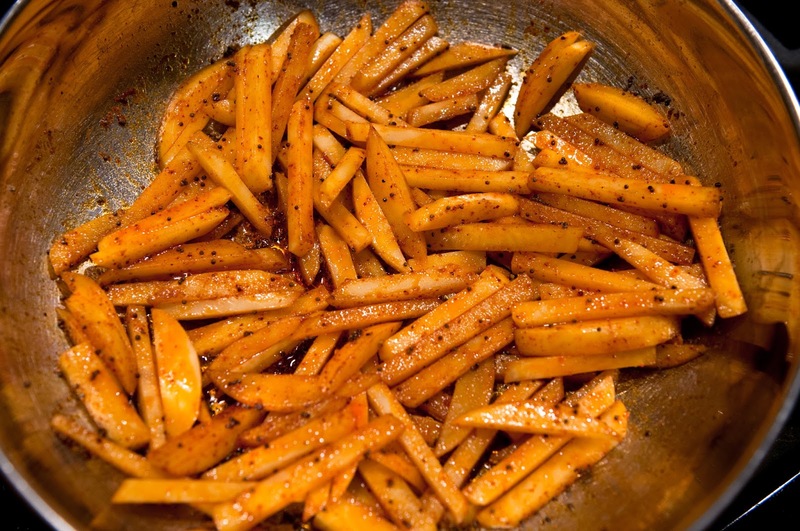 While the potatoes are cooking, grind cumin seeds and coriander seeds into a fine powder. Add sliced ivy gourd and mix. Add powdered cumin and coriander mixture. Also add sugar, if using, amchur powder and remaining salt. Mix well. 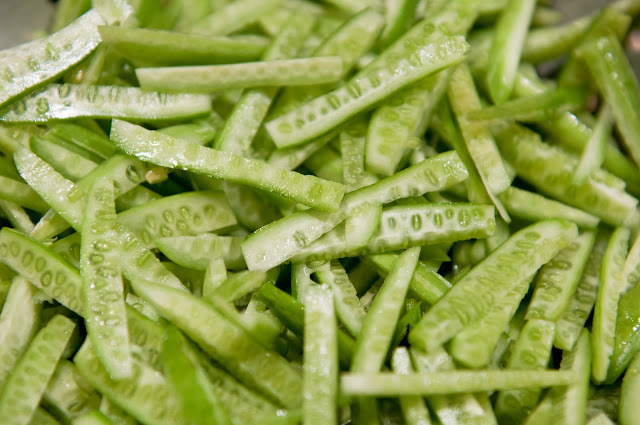 Cook covered on medium-low for 7-10 minutes until the ivy gourd is cooked but still crunchy. Stir occasionally to prevent the veggies from sticking to the bottom of the pan. Adjust seasonings, garnish with chopped cilantro and serve hot with rotis. If you don't have amchur, you could add a dash of lemon juice towards the end. You could use any vegetable that will hold its own and not release any juices instead of ivy gourd. I make okra the same way but cut the vegetable along its width and dice the potatoes into small cubes. It's a wonderful veggie for diabetics, helps lower blood sugar. Thanks, Anjali, I did not know that! Wonderful, beautiful photos as always! 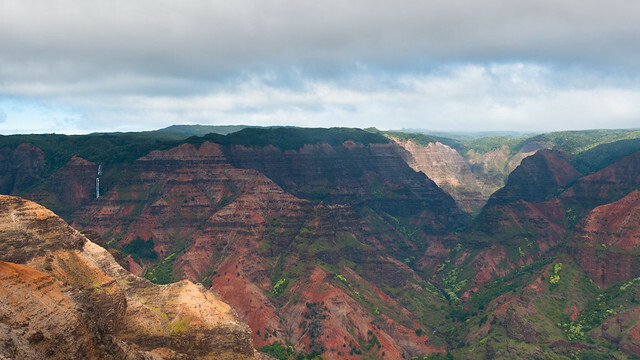 I've always wanted to see Hawaii. Growing up in the Midwest in the 1960s I remember a college friend of my oldest sister airmailed my mother a pineapple, some sugar cane and hibiscus blossoms. It was all new to us--imagine, pineapple that didn't come in a can of syrup! Never heard of Ivy Gourd, but if I see it here I will grab some. Recently I've been eating a lot of lotus root salad...do you have any delicious recipes for lotus root? I hope you got my email...I'm sorry I got so confused. Hope I didn't confuse you too much! Anna, I did get your email and had a good belly laugh! I will reply soon. 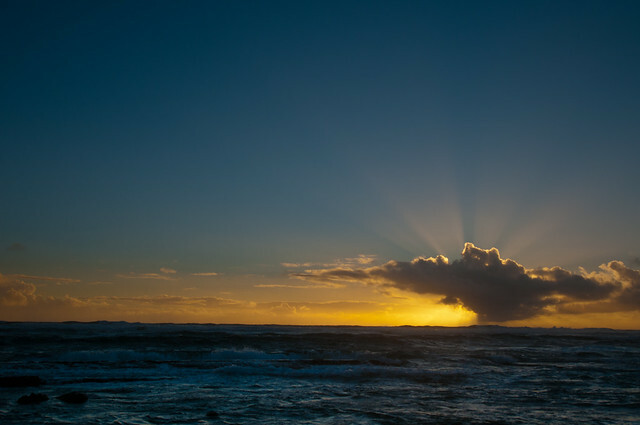 I thought I could bring some sugarcane back with us but luckily, my husband looked up Hawaii's regulations before we flew out and did not allow me to pack any fresh fruit or vegetables in my bags! I haven't cooked with lotus root. I will let you know if I find any interesting recipes. Stay well, my friend! Looks delicious. There's a restaurant near us that serves it regularly on the buffet, but I haven't hunted for it in stores. Nice clicks of Hawaii, I like this recipe, I enjoy this green vegetables with potatoes as well, we call it parmal. 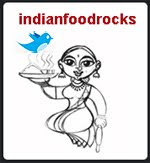 My daughter Rachna introduced me your blog, I liked your facebok page also. Nice to meet a veteran blogger like you. Happy New Year! It's never too late! The gourd season will be upon us soon. I've never cooked them with potatoes before! Imagine that. Looks delicious but unfortunately we don't get it where we live....good to see another recioe from you though! Manisha - do you have another name for the vegetable? I'd like to try and grow some this summer, but I need to find some seeds.... Alternatively, do you know where I could get some seed? I'll happily share the fruit! So far I've looked on seedsofindia.com and kitizawaseed.com - but don't think I see it. 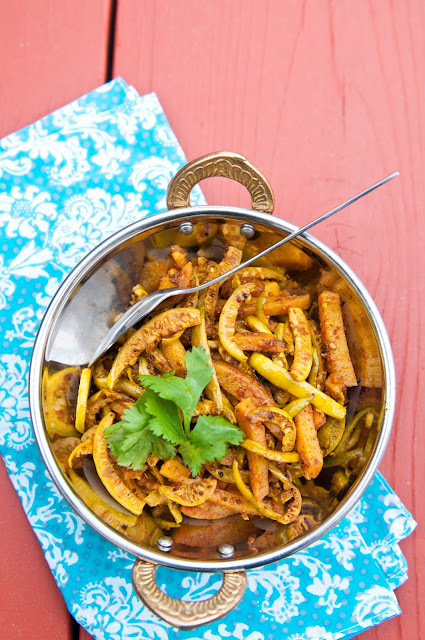 The first time I tried tendlichi bhaji, I overcooked it. Then stumbled across your blogpost. And now I can cook it almost perfectly!